The two top names currently being bandied about for the Democrat presidential slate in 2016 are Hillary Clinton and Elizabeth Warren. Democrats are saying that Hillary is “inevitable.” I recall them saying the same thing in 2008, and that was before she had the Benghazi albatross hanging about her neck. My suspicion is that, just as happened in 2008, were she to run, the media would roll out the red carpet for her, and she’d soil it within a few months. No matter what Hillary does, she cannot get past the fact that, at some visceral, lizard-brain level, people who are not true believers neither like nor trust her. And I do mean visceral. We here are informed about what a squirrelly person she is, both personally and politically, whether one looks at Benghazi, lesbianism, political and economic ties to antisemitic Arab leagues, or whatever else. Most Americans neither know nor care. They just don’t like her. I’m embarrassed to admit this about the American people, but I suspect even Obama’s manifest, gross, far-reaching lies about Obamacare will eventually get nothing more than shrugs from Americans. Those who are ideologically blind will even add “The Republicans made him do it.” So Warren’s lies won’t get her. I suspect that what will destroy Warren in the end is the same thing that wiped out Hillary: she’s not likable. Exactly like Hillary, Warren is angry, smug, and condescending. Obama is too, but he was clever enough to hide that on the campaign trail. Hillary couldn’t and Warren can’t. My own outdated experience with having Warren as a law professor some decades ago is that she’s also a terribly bad communicator. Like Obama, she does fine with the prepared speech, but she’s incoherent when she’s off the cuff. And unlike Obama, she’s not black nor does she have a photogenic smile nor “ripped abs” to help her out. Ask her the right question, meaning an important question for which she doesn’t have a pre-packaged answer, and all you’ll get is a boatload of angry BS. 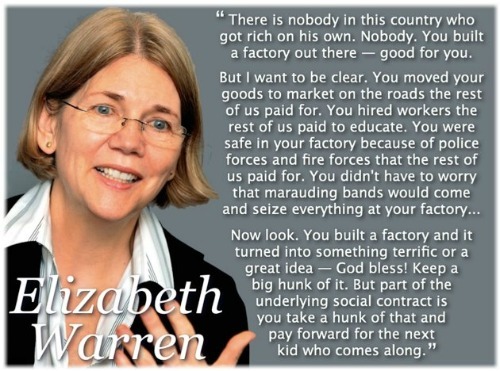 William Jacobson, of Legal Insurrection, thinks as I do about Warren, and therefore devoutly hopes that she runs, because he’s assuming that she will collapse before a Republican candidate. I’d like to agree with him, but I fear greatly that Republicans will, as always, destroy themselves. With our luck, rather than having Ted Cruz, or Bill Lee, Alan West, or even Chris Christie (whom I’ve come to dislike but whose still more conservative than not) on the ballot, Republican primaries are going to result in our having John McCain on the ballot. Indeed, with Open Primaries now in major states such as California, the best tactic the Democrats could use would be to put John McCain or Lindsay Graham or some other self-hating “conservative” on the ballot against Warren or whomever else the Democrats run with.